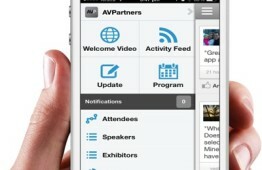 AVPartners has launched an innovative events app at Perth Convention and Exhibition Centre, set to create a genuinely interactive event experience at the world-class venue. The app, PCEC, integrates social media tools, gamification, surveys and live polls with up-to-date event information to ensure Perth Convention and Exhibition Centre events are accessible and relevant for event attendees online, as well as offline. Delegates can post updates, tag their location, like and comment on posts and send private messages all from within the app. They can also access up-to-date event documentation, such as programs and flyers, speaker, attendee and exhibitor information. Using PCEC, event organisers can easily update event information and send targeted push notifications to attendees in real-time. Event sponsors can also benefit through branded content and advertising within the app. Designed for all smart phones, the app also facilitates reporting on active users and interactions within the app, thanks to a built-in analytics function. Leveraging the latest in event technology, PCEC is provided through a partnership between AVPartners and American mobile event app developer DoubleDutch. With numerous unique spaces including a 2,500 seat theatre, Perth’s largest Ballroom, six exhibition pavilions, multiple meeting rooms, boardrooms and two unique outdoor spaces, PCEC is a great choice for events no matter what the type or size. Each year, over 700,000 people attend one or more of the 600 plus events conducted at Perth Convention and Exhibition Centre. The news of the event app launch follows a bumper year for AVPartners in Perth, with the provider hitting a number of milestones in 2014. AVPartners re-signed the Audiovisual Services agreement at Perth Convention and Exhibition Centre and was awarded the Exhibition Rigging contract with PCEC. AVPartners has enjoyed a partnership with PCEC for over five years. AVPartners provides audiovisual and exhibition rigging support for events at the venue and professional technical assistance for delegates.